Drown out the world, generate bead projects, and go on a miniature adventure with today’s collection of apps and games. Sleep Bug Pro: White Noise Soundscapes & Music Box ($1.99 → Free, 223.8 MB): Drown out the world with Sleep Bug. Anyone who wants to improve the quality of their sleep and life. Sleep Bug Pro: White Noise Soundscapes & Music Box is available for free for a limited time. It has a 4.5-star rating with a total of 457 ratings. Bead It! 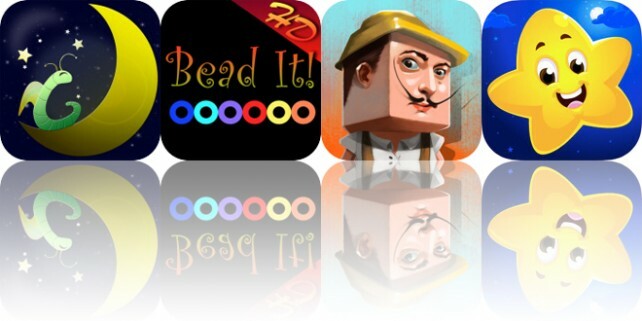 HD ($3.99 → Free, 5.3 MB): Generate bead projects from images with Bead It. Creative types. Pick any photo from your library, crop it, and determine a bead image size and color palette. Bead It will then create a pattern along with a list of all of the bead colors required to complete your project. You can save your beaded image or share it with a friend via email. The app also includes seven color palettes to choose from, and the ability to use grid lines. Bead It! HD is available for free for a limited time. It has a 3.5-star rating with a total of 134 ratings. Squareface ($0.99 → Free, 1.0 GB): Go on an adventure to uncover the mystery of the cardboard figurines in Squareface. Fans of action games. Squareface puts you square in the middle of a miniature adventure. Run around open environments picking up whatever tools and weapons you can find and bring the fight to the cardboard figurines lurking in the shadows. The third-person view provides a compelling way to move and battle your foes without feeling unwieldy. The game includes more than 40 missions, base building and defense mechanics, tons of upgrades to unlock, and iCloud syncing. Squareface is available for free for a limited time. It has a 4.5-star rating with a total of 19 ratings. KidloLand Kids Nursery Rhymes ($1.99 → Free, 296.9 MB): Introduce your child to a world of fun and learning with KidloLand. Parents. KidloLand is an complete learning program for young children. The amount of content is staggering, with more than 130 popular nursery rhymes, 425 original songs, 230 stories, 400 activities, 100 math games, and six coding games. There’s truly something for every child here. KidloLand Kids Nursery Rhymes is available for free for a limited time. It has a 4-star rating with a total of 9526 ratings. That concludes today’s issue of Apps Gone Free. If you like staying on top �of these daily deals, don’t forget to check out our free AppsGoneFree app. It provides all the deals each day, and even an archive of past deals that are still active. To submit an app, simply send a request to tyler@appadvice.com with the subject “Apps Gone Free.” Please include the name of the app, a link to it in the App Store, when and for how long you intend to offer the app for free, and anything else you would like to share. We will take it from there.